We have moved and are currently designing and building new studios. During this time, we regret we will be unable to fulfill any orders. A hallmark is a series of marks applied by an independently run assay office which guarantees the precious metal content of items containing gold, silver, platinum or palladium. In the U.K. hallmarking is a legal requirement for items above a certain weight. For silver items this is 7.78 grams. 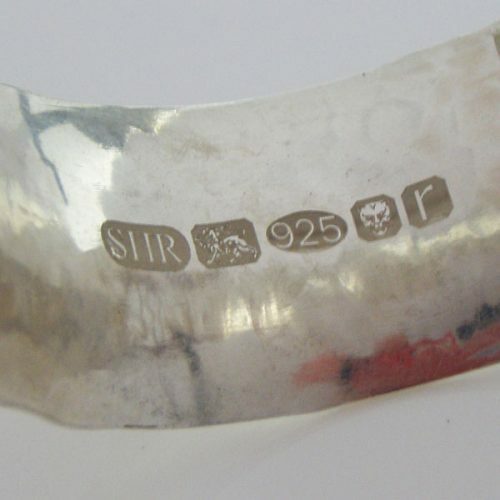 These marks show that your item has been tested and marked by the Goldsmiths’ Company Assay Office. The Goldsmiths’ Company began hallmarking in 1300 and is the oldest hallmarking authority in the world. Indeed the term hallmarking means “marked at the Goldsmiths’ Hall” The distinctive Leopard’s head mark has appeared on the work of the most prestigious makers in history.